Of course, it'd be swell if everybody helped others eat well all year round. But the winter holidays are traditionally a time of giving, and donations to charities and nonprofits typically peak this time of year. Here are a few national and international groups doing worthy year-round work in the realm of better food for all. #(n1). Since 1944, Heifer International has worked to ensure that those in need can feed themselves. Instead of handouts or temporary relief, Heifer International equips people around the globe with livestock, including sheep, pigs, bees, and, yes, heifers. #(n2). An affiliate of Oxfam International, Oxfam America has a broad mandate: to create "lasting solutions to poverty, hunger, and social injustice." The organization's efforts, which are often publicized through their relief work, include working on agricultural, trade, health, and natural-resources issues. #(n3). A spinoff of the national consumer advocacy group Public Citizen, Food and Water Watch focuses on food safety, agriculture, fisheries, and water rights. Their mission? To challenge "the corporate control and abuse of our food and water resources by empowering people to take action and by transforming the public consciousness about what we eat and drink." #(n4). 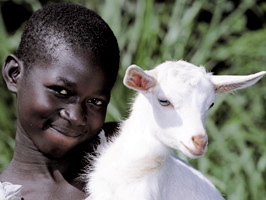 [%image promo-image float='clear right' width=350 credit="Photo: Darcy Kiefel/Heifer International" caption="A youngster in Kenya with a baby goat provided by Heifer International."] The mission of the Environmental Working Group is "to use the power of public information to protect public health and the environment." EWG's online services include Food News, which focuses on pesticides. Like Food and Water Watch, above, the Environmental Working Group labors across a wide field of issues, including agriculture, natural resources, and health. #(n5). A website dedicated to educating readers about the benefits of grass farming (and the animals raised thereon), Eat Wild offers both agricultural info and direct access to scores of farmers and purveyors. #(n6). The Organic Consumers Association declares itself to be "the only organization in the U.S. focused exclusively on promoting the views and interests of the nation's estimated 50 million organic and socially responsible consumers." But the OCA isn't just about organics; the nonprofit works on a wide range of sustainability issues, including food safety, industrial agriculture, genetic engineering, corporate accountability, fair trade, and environmental sustainability. #(n7). The American branch of Slow Food International, Slow Food USA does much of the same work as its Italian progenitor: meeting, publishing, and eating in the name of local, sustainable, traditional, regional, authentic, non-industrial food — "in essence, a food system that is good, clean, and fair." #(n8). Food Alliance is a farm-certification nonprofit that certifies farmers, ranchers, and food handlers "who produce food in environmentally friendly and socially responsible ways." They share the goal of the National Campaign for Sustainable Agriculture: sustainable food for everyone.